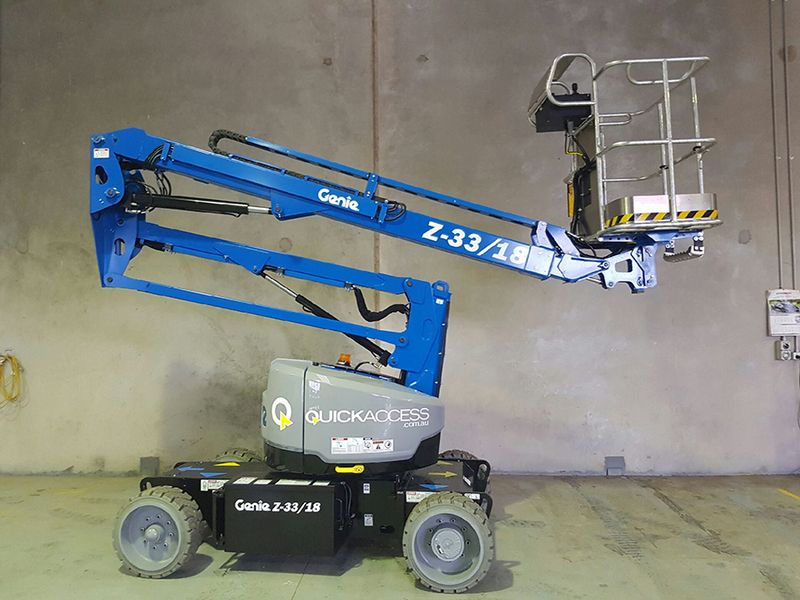 In a first for Melbourne, Brooklyn-based Quick Access Rental and Training, has taken possession of the Victorian capital’s first ever Genie Z-33/18 boom lift, the entirely new compact, lightweight electric Z-boom lift. “Designed for maintenance applications, this versatile articulating Genie boom lift model is well-suited to applications on sensitive surfaces inside airports, shopping centres, theatres, even museums and galleries, in addition to routine outdoor tasks,” said David Greene, Sales Manager Victoria & Tasmania, Genie. Craig Barr from Quick Access, agreed the agility of the Genie Z-33/18 boom lift is a major advantage, along with its lighter weight. This new versatile articulating Genie boom lift model weighs only 3,640 kg (8,025 lb) and offers a ground clearance of 15 cm (5.9 in). Increased construction site weight restrictions will also bring the Genie Z-33/18 boom lift into its own. “This means we can now provide a lighter-weight option to my clients,” said Barr.